In this two-part news report by Senior Editor Mark Heschmeyer, CoStar analyzed the stores being closed by the three major department store chains, Sears, Macy's and JC Penney. Over the last three years, the three chains combined have closed 1,195 locations in 860 cities. Among the hardest hit cities were: Jacksonville, FL, and Louisville, KY, each with seven closures; Philadelphia and Pittsburgh each have seen six; and Chicago, West Palm Beach and El Paso, TX, have each had five. Sears shows the most closures: 828, (with more than half those being Kmart stores). JCPenney has closed or announced plans to close 236 stores. Among those are 138 it identified for closure late last week. Macy’s has closed or plans to close 131, including 68 of 100 planned closures it announced two months ago. Gulf View Square, Port Richey, FL. While none of the department stores disclosed the specific criteria they use to decide which stores to close and which to keep open, CoStar research has developed a proprietary Location Quality Score (LQS) to evaluate more than 1.5 million retail properties in the CoStar database. Using multiple variables, including trade area incomes, retail density and market competition to approximate the productivity of a given retail property, the CoStar Location Quality Score can provide insight as to whether the store closure is warranted by a location in a poor trade area, or whether it is in a good trade area but just too close to another of the retailer's stores, in which case the location could support a different retail user. The Durst Organization today made its first acquisition outside of New York, purchasing approximately five acres of waterfront property in Philadelphia from Brandywine Realty Trust (NYSE: BDN). The privately held real estate firm purchased the land assemblage spanning Piers 12, 13-15, 19 and 24 north of Benjamin Franklin Bridge along the Delaware River known as the Philadelphia Piers at Penn’s Landing for a reported $21.4 million. The properties include several existing tenants, including a Dave & Buster's entertainment center, Hibachi Japanese Steakhouse, Morgan’s Pier beer garden, a marina and a DLC Management parking facility. In a release, New York City-based Durst said its acquisition reflects the company’s recognition of Philadelphia’s economic growth and future potential. Durst cited Philadelphia Mayor Jim Kenney's recent commitment to allocate $90 million toward a $225 million project to build an 11-acre park and canopy-deck over I-95 that will connect Center City with Penn's Landing as a move that opens the waterfront for future development. Durst, which owns 4 Times Square and One World Trade Center in Manhattan among other trophy properties, said it has no immediate development plans for the site, which it plans to keep as a long-term hold. Philadelphia is currently experiencing a development boom, with major projects under way in Center City and other areas within the metro, including the ongoing revitalization of Schuylkill Yards and the Philadelphia Navy Yard. The Delaware River Waterfront Corp. has embarked on a series of master-planned revitalization projects along the central Delaware riverfront, setting the stage for the I-95 park and canopy project, which has received commitments for a reported total of $190 million of its $225 million cost. TJM Properties, the owner of the now-closed Atlantic Club Casino Hotel at 3401 Boardwalk in Atlantic City, NJ, has put the property under contract for an undisclosed price. The sale is expected to close at a later date. The Atlantic Club Casino Hotel has been closed since January 2014. It was constructed in 1980 on 2.6 acres and underwent renovation in 2012. The buyer, R&R Development Group LLC, plans to construct a 100,000-square-foot indoor, family-friendly entertainment facility to include a water park, hotel, restaurants and an arcade. The firm will invest more than $135 million and expects to have 300 hotel rooms delivered by this fall, while the water park construction is expected to take one or two years to complete. Cedar Realty Trust, Inc. acquired the Christina Crossing shopping center on Howard St. between S. Market St. and S. Walnut St. in Wilmington, DE for $29.3 million, or about $240 per square foot, to Cedar Realty Trust, Inc. The retail center delivered in 2008 in Wilmington's CBD submarket and totals 122,002 square feet. Notable tenants include ShopRite and Rainbow. Post Brothers Commercial Real Estate has secured an almost $102.8 million first mortgage to complete its redevelopment of the historic, and vacant, Atlantic Building office property at 260 S. Broad St. in Philadelphia, PA.
Russell Schildkraut and Christine Zivkovic of The Ackman-Ziff Real Estate Group arranged the financing on behalf of the borrower, placing the floating-rate loan with Natixis Real Estate Finance Americas. The 21-story office building was originally built in 1923 on almost half an acre in the Market Street West submarket of Philadelphia County. The property is being redeveloped into a 268-unit multifamily rental property with an anticipated completion date of later this year. The new property will continue carrying the name The Atlantic, and will boast an unparalleled amenity package including a business lounge, clubhouse, fitness center with yoga studio, rooftop swimming pool and deck with dog park and grilling areas. It is conveniently located along the Avenue of the Arts section of South Broad Street, within walking distance of cultural, dining, and retail destinations as well as several entertainment venues including Kimmel Center for the Performing Arts, Merriam Theater, Academy of Music and the Wilma Theater. "The Atlantic will be another premier residential building that will be similar to previously delivered first class Post Brothers buildings and will take full advantage of the vibrant and growing Center City market," commented Greg Murphy, head of Natixis. Ryan Commercial LLC has completed construction on Building 5 in the Carlisle Distribution Center at 45 Logistics Dr. in Carlisle, PA. The 582,000-square-foot industrial warehouse is located on 40 acres in the Harrisburg Area West Industrial submarket of Cumberland County. It was under construction for almost a year, and features car and trailer parking, ESFR Sprinkler, 80 loading docks and two drive-ins, 36-foot clear heights and fluorescent lighting. Built on spec after several years as a proposed building opportunity, the completed asset is now actively being marketed for sale and for lease, divisible down to 150,000 square feet. Is this the holy grail project that could jump-start revitalization of North Philly? Real estate magnate Ziel Feldman’s properties are in some of Manhattan’s poshest neighborhoods. Now, he wants to build in one of Philadelphia’s most destitute. 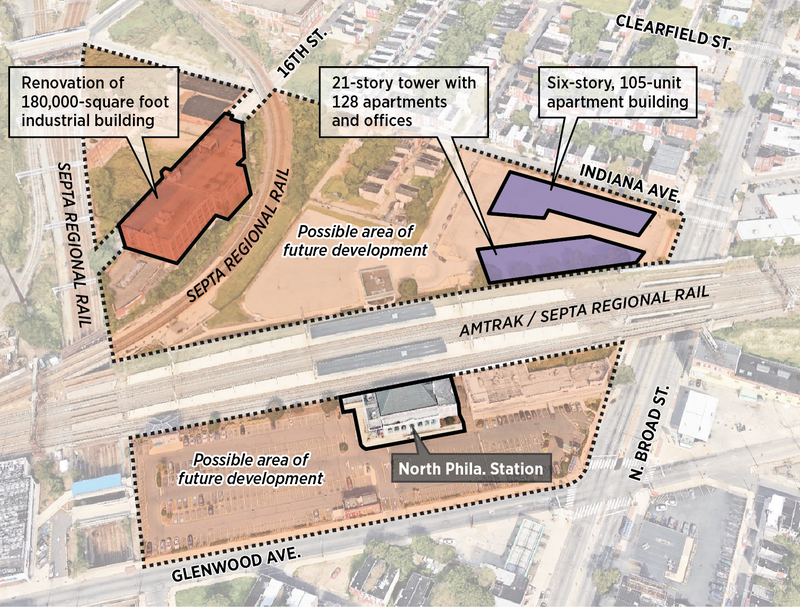 Feldman’s HFZ Capital Group is part of a consortium of New York investors planning a complex of homes, offices, labs, and start-up work spaces in what is now an enclave of vacant warehouse properties and empty lots around Amtrak’s North Philadelphia station. The $162 million first phase of North Philadelphia District LLC’s proposal calls for two new buildings on what is now the train station’s parking lot, and the renovation of a hulking dilapidated factory site nearby, said Michael Shenot, who is leading the project as a managing director with the real estate services firm JLL, in an interview Friday. Work could begin before the end of the year if the investor group is granted its request for a $20 million state redevelopment grant to cover parts of the project, said Shenot, who previously participated in developing the World Trade Center Transportation Hub. He is now working on an expansion of New York’s Penn Station involving a historic postal building to its west. If the group’s plan is successful — no sure thing in an area that has shown few apparent signs of readiness for revitalization — its impact on this North Philadelphia neighborhood could be enormous, said Harris Steinberg, who directs Drexel University's Lindy Institute for Urban Innovation. The site could capitalize on the train station’s citywide access via SEPTA’s Regional Rail system and its Amtrak link to New York, as well as its location barely a half-mile north of Temple University’s main campus and just a few blocks south of its Health Sciences Center complex, Steinberg said. Zamir Equities has expanded it Philadelphia area footprint and has acquired the Triad building in King of Prussia for $30.2 million. Kairos Real Estate Partners and Artemis Real Estate Partners bought the four-story, 184,000-square-foot office building at 2200 Renaissance Blvd. in 2013 for $8.1 million from a special servicer. At the time, the building, which was constructed in 1985, was 20 percent occupied and a long way from where it was in 2002 when Mack-Cali Realty Corp. paid $26.3 million to buy it. Mack-Cali had given the building back to the lender roughly 10 years after its purchase. That distressed scenario was what Kairos was looking for when it bought the building, the first it acquired as a new company. The real estate company seeks out properties that have been taken back by a lender or are in special servicing, have high vacancies, and need interior and exterior renovations. It deployed that strategy at Triad, spending $4 million on a series of upgrades that have become part of its signature with newly acquired properties. Kairos puts in a cafe, conference/training center and full-service fitness facility as well as incorporates newly-designed common areas and lobbies. Cross Properties has zeroed in on a corner of Lower Merion referred to as Bala Village and has plans to spend roughly $100 million to develop upwards of 300 multifamily units. In separate transactions, the developer acquired three properties where it anticipates rolling out its plans in phases and is poised to start reshaping a part of Bala Cynwyd that has been on the township’s radar for years. In 2000, the township had a master plan completed on the quaint corridor – Bala Avenue between City and Montgomery avenues – that sought to address some of the issues challenging it. It needed better lighting, connectivity and landscaping as well as ways to make it more pedestrian friendly, according to the plan. It also needed to seek out ways to get some dormant sites, such as a former BMW dealership, redeveloped or reused. The Bala Theater, an anchor, closed up in 2014 and siphoned off some of the activity the street had seen over the years. In 2014, a separate zoning overlay was done for Bala Avenue that was not part of the one adopted for City Avenue since it has more of a neighborhood feel to it, said Terrence Foley, president City Avenue District. Childrens Services Inc., leased of approximately 14,330 square feet of office space on the second floor of 719-99 West Girard Avenue. Semark Associates is the limited investment corporation that owns the three-story, 40,000 square foot multi-tenant building. Schottenstein Property Group sold the MacArthur Towne Center at 2520-2590 Macarthur Rd. in Whitehall, PA to Abrams Realty & Development LLC for $14.3 million, or about $94 per square foot. The 151,418-square-foot retail community center was 95 percent occupied at the time of sale, anchored by American Signature Furniture. Other key tenants include Jo-Ann Fabric, David's Bridal, 2nd & Charles, Aaron's, T-Mobile and Party City. The center is shadow-anchored by Kmart and Lowe's, which were not included in the deal. We all know that the famous zeps at Eve’s Lunch taste like a million bucks, and now the highest bidder at a bankruptcy court auction apparently thinks so too. An unidentified buyer purchased the 9-year-old strip mall that houses Eve’s Lunch, The Untapped Artist, U.S. Department of Veterans Affairs center, Creative Designs and Joe’s Water Ice & Ice Cream at 320 E. Johnson Highway for $1,632,400 at a live auction on Thursday afternoon. The auction, which was overseen by Maltz Auctions, was held at United States Bankruptcy Court for Eastern District of Pennsylvania, 900 Market St., Philadelphia, with an opening bid of $1,275,000, noted Maltz Auctions spokesperson Kerry Goldberg. “Unfortunately, we can’t reveal the name of the buyer,” she said. A property search revealed 320 E. Johnson Highway as the address of Antonelli’s Dry Cleaners, which is not among the current lineup of tenants. Although the center appears to be fully occupied, that’s not the case, Goldberg said. “Technically, the building is only 54 percent occupied, because there are four retail units on the first floor and four office suites on the top, and not all of those office suites are taken,” she explained. The Maltz website, MaltzAuctions.com, listed the center’s projected gross income as $279,000. A Section 1031 like-kind exchange crossed the Delaware River recently. The Coining Building, a single-story 60,000 square foot class A office building and high-tech manufacturing facility located at 15 Mercedes Drive in Montvale, Bergen County, NJ, sold for $12.5 million. Island View Crossing, a 180,000 square foot class A office building at 1414 Radcliffe Street in Bristol, Bucks County, PA, traded for $20 million in the deal. The Coining Building is fully leased to Coining, the world’s largest solder preform manufacturer, owned by AMETEK. The seller, identified as Hudson Equities by Real Capital Analytics, a proprietary research database, the buyer was identified by Real Capital Analytics as Michael Axelrod, a local investor. Island View Crossing is a large three-story building situated near the Delaware River. Tenants include Lenox Corporation, Staples, and Strategic Distribution. The property, previously owned by Red River Asset Management, was redeveloped from an industrial building to a class A office in 2004. At the time of closing, the property was approximately 93-percent occupied. Jefferson Health will offer expanded services at 3 Crescent Dr. in Philadelphia, PA following a new multi-year, 70,000-square-foot lease with the landlord, a joint venture between Liberty Property Trust and Synterra Partners, to open a new facility in the Navy Yard by mid-2018. The four-story, 95,261-square-foot, 4-Star office building sits on 4.8 acres in Philadelphia's Navy Yard Corporate Center. "The Navy Yard location offers great accessibility from major arteries, including I-95 and I-76. It has also enjoyed significant expansion as a progressive campus with more than 13,000 employees and 150 companies, and more to come," said Larry Merlis, executive vice president and chief operating officer for Jefferson Health. "We look forward to realizing the tremendous opportunities for growth that the area presents, being a good neighbor to our fellow tenants as they continue to grow, and becoming a comprehensive healthcare provider at the Navy Yard." With its new space, Jefferson plans to create a consumer-oriented healthcare destination in the Navy Yard, drawing on its accessibility for patients across southeastern Pennsylvania and southern New Jersey. The project will include a multidisciplinary adult health and wellness center offering diagnostic, consultative, therapeutic and procedural services, dedicated primary care and complementary specialists, and a full-service imaging suite and lab, in addition to multidisciplinary and comprehensive services and complementary programs with a primarily ambulatory orientation. The expansion at the Navy Yard aligns with Jefferson’s commitment to deliver services that meet the health needs of the community locally, and to serve more patients in Philadelphia, South Jersey, the Northeast, and Delaware and Chester counties by offering even more co-located services that are convenient for the consumer. "We appreciate Jefferson’s continued commitment to the Navy Yard and recognize the value they bring to this vibrant campus," said Brian Cohen, vice president and market officer for Liberty Property Trust. "The establishment of their new customer-oriented healthcare facility will be an extremely convenient and important resource for the thousands who work and visit here. We are pleased to be able to accommodate this significant growth and provide Jefferson with the large, high-quality environment they envisioned." Liberty's portfolio at the campus is now 96 percent leased. Future development of the Navy Yard will support up to 13.5 million square feet of mixed-use space. Keystone Property Group is delighted to announce that Philadelphia Magazine, the award-winning monthly magazine published in Philadelphia by the Lipson family and its company Metrocorp, has signed a long-term lease at The Curtis, Keystone’s iconic, mixed-use office property, located at 601 Walnut Street in the Washington Square section of Philadelphia. Philadelphia Magazine’s move to Washington Square is representative of the publication’s evolution in today’s rapidly changing media landscape. The historic neighborhood has enjoyed a renaissance in recent years, and has developed into a hub for the creative and technology sectors, becoming the corporate home of many companies in these spaces. With a vibrant pedestrian experience replete with dining, nightlife and entertainment options, the area has also emerged as one of the most sought-after residential areas for the creative demographic that works at these firms. Built as the home to the Curtis Publishing Company, the property is a fitting home for Philadelphia Magazine, having housed several of the 20th century’s largest, most influential publications, including the Ladies’ Home Journal and The Saturday Evening Post. When Cyrus Curtis developed his headquarters there in 1910, he gained instant notoriety as a pioneer and an innovator by incorporating many of today's most desirable amenities, including significant outdoor space, roof deck access, lounges, and recreation areas for the employees. After nearly 100 years, these once-quaint amenities are now recognized for their ability to promote an ideal, innovative corporate culture, and are highly sought-after attributes in today’s modern office market. In addition to The Curtis, Keystone’s holdings in the immediate area include 100 Independence Mall West, the historic Dow Chemical building, which has been reimagined with a dynamic indoor-outdoor experience for pedestrians, replete with the popular Independence Beer Garden and a La Colombe coffee café. In 2016, Keystone also acquired The Washington — the former Penn Mutual Tower — which is located within steps of The Curtis. With the area’s growing pedestrian traffic, Keystone intends to implement a variety of property upgrades to The Washington, while repurposing existing commercial space to retail use. Dollar Tree signed a lease for 23,000 square feet at 315 E. Main St. in Wrightstown, NJ. The 23,000-square-foot, single-tenant freestanding retail building was constructed in 1970 in South Burlington County submarket. Saks Off 5th signed a retail lease for 40,263 square feet on the second floor at 310 Goddard Blvd. in King of Prussia, PA. The 91,739-square-foot building is co-anchored by Best Buy on the first floor, with the discount department store chain filling space previously occupied by Nordstrom Rack, another discount department store chain. The building was constructed in 2000 within the 195,528-square-foot The Overlook at King of Prussia shopping center in Montgomery County. Washington, DC-based real estate developer MRP Realty, along with Barings Real Estate Advisers, a Hartford, CT-based global asset management firm on behalf of an institutional investor, have closed on the acquisition of the Three Parkway office tower at 1601-1645 Cherry St. in Philadelphia, PA. TIER REIT, Inc., a self-managed, Dallas-based real estate investment trust, sold the asset for $95 million, or about $169 per square foot. "As we have announced, we have embarked this year on the recycling phase of our strategic plan," stated Scott Fordham, president and CEO of TIER REIT, which acquired the asset in 2006 from Amstar for approximately $90 million, according to CoStar data. "We intend to utilize the proceeds to repay borrowings outstanding under our credit facility and for strategic reinvestment in our target growth markets." "MRP’s acquisition of Three Parkway is an exciting addition to our growing portfolio in Philadelphia," said Charley McGrath, managing director of MRP. "Since its completion more than four decades ago, Three Parkway has been the premier local address for some of the Nation's most influential organizations and we are committed to continuing to attract high caliber tenants by providing the best space and amenities possible." Three Parkway is a 20-story, 561,631-square-foot, 4-Star office building originally constructed in 1970 on one acre in the Market Street West submarket of Philadelphia. At the time of sale the asset was 86 percent occupied with a weighted average lease term of 6.5 years, anchored by Drexel University and excelleRX, with IBM, Enclara Pharmacia, Reliance Insurance and Strayer University taking space there. The building was renovated in 2005, but MRP reports it has planned extensive additions to common areas as well as the addition of a brand new fitness center and a tenant lounge. Asking rents at the tower were in the $26-$29 per square foot range, though average 4- and 5- Star office asking rents in the submarket top $30 as of the fourth quarter, 2016. "The market will increasingly be about haves and have-nots. You’re going to see a tale of two cities, and that tale is going to be who has amenities and who’s easy to get to on transit lines." noted McGrath, speaking on a panel forum at the Bisnow 2017 State of the Philadelphia Office Market event. "We’re approaching office like we’ve approached residential, and we have been for some time. You put in a fitness center people want to go to. You put in a roof deck so that if someone is in the office and they need to call their wife, they can step out of the office and sit down and enjoy a 15-minute conversation. It’s the touch and feel that all of us want, and making sure you’re buying the asset at the right number so you can provide it." The building, designed by Kneedler Mirick Pearson Bachelor & Ivonen with Allabach & Rennis on structural design and Pennell & Wiltberger on mechanical and electrical, consists of a full basement, 20 floors of rentable office space and two mechanical floors. The ground floor is occupied by a cafeteria and dining facility, while the basement houses a gym, storage space and a production studio. Base building systems were upgraded in 1997 under an $11 million capital improvement program that included three new 500-ton Carrier chillers and three-cell tower with automated system, a new plate and frame heat exchanger, building-wide water loop, the installation of sprinklers, a fire alarm system, emergency generator and circuit breaker panels on 19 upper floors, computer-control elevator conversion and restroom renovations on 18 floors. Philadelphia’s coworking industry had a good year in 2016 in terms of leasing activity, construction and renovation completions, A Philadelphia research team released its fourth-quarter 2016 Coworking Space MarketBeat report, which also projects continued demand for coworking office space market-wide through 2017. As of the fourth quarter of 2016, Philadelphia was home to 19 operators offering a total of 507,914 square feet of coworking space. Companies expanding their presence in 2016 included New York-based WeWork, The Yard and Joynture, as well as the Philadelphia-based provider Benjamin’s Desk. WeWork signed three leases totaling 113,170 square feet in the Central Business District market. The Yard expanded by opening a 24,000-square-foot branch in the East of Broad submarket of the CBD, occupying four floors of the newly-renovated William Steele and Sons building at 15 South 11th Street. Benjamin’s Desk grew its presence in the city by 11,693 square feet in the West of Broad submarket of the CBD, and signed a 12,528-square-foot lease at 30 North 41st Street in the University City market. The company also was selected as the operator and manager of the 40,000-square-foot incubator at the University of Pennsylvania’s recently delivered Pennovation Center facility. While many coworking companies prefer to have branch offices in the city’s Central Business District, Joynture chose to open a location just outside of the CBD. In June 2016, the company moved into a newly-renovated 23,000-square foot retail/office building at 417 South Street. The Kraft Heinz Company sold the Kraft Heinz Food Manufacturing & Distribution building at 7352 Industrial Blvd. in Allentown, PA for $36.49 million to Ridgeline Property Group LLC. The 907,160-square-foot industrial building was built in 1972 in the Lehigh Valley Industrial submarket. The former condiment manufacturing facility is set for demolition in March, with the new owner planning to redevelop the 91.9-acre lot into a class A distribution center comprised of two buildings totaling 1.46 million square feet. The project is being billed as the Park 100 Logistics Center, with construction set to begin in summer 2017. Saying it needs to retrench in order to return to profitability, national electronics and appliance retailer hgregg Inc. (NYSE:HGG) announced plans to close three distribution facilities and 88 of its stores as it reallocates resources back to its core markets and online sales efforts. The stores being closed were identified as being in locations “that are no longer strong shopping destinations due to changes in the local retail shopping landscape,” he said. Following the closures, The Indianapolis-based chain said it will continue to operate 132 stores. The closings, which eliminate 1,500 positions, will hit the Mid-Atlantic region hardest with 15 store closures in Pennsylvania and Virginia and 11 in Maryland. Another 15 hhgregg stores are also being closed in Florida with smaller numbers of stores being closed in other states. In addition, hhgregg will close its distribution and delivery centers in Brandywine, MD; Miami and Philadelphia. “We have determined that the economics of the affected locations will not allow us to achieve our overall goal of becoming a profitable company again,” Riesbeck said. hhgregg announced plans to expand across the Mid-Atlantic with up to 45 new stores in the summer of 2009 - six months after rival Circuit City decided to shut down 567 stores and let go 30,000 workers. hhgregg jumped at the opportunity it saw to gain market share and take advantage of cheap rental rates due to an excess supply of available real estate. At the time, the aggressive expansion strategy was seen as in keeping with the firm's longterm national growth plans under its late founding-family head, Jerry Throgmartin, and backed by investment firm Freeman Spogli & Co. However, analysts said the firm ran into unexpected setbacks, including Throgmartin’s untimely death, disruptions in its core television business, as well as suffering from bad timing expanding in a recession and increased e-commerce competition from Amazon.com and others. Last month, hhgregg engaged Stifel Financial Corp. to pursue a range of potential strategic and financial transactions. “We are committed to improving our results through our business strategy, including investments made to shift our focus to appliances and furniture, and additional expected cost reductions,” Riesbeck said about the hiring. Current inventory in the affected stores will be sold over the coming weeks, with final store closings expected to be complete by mid-April. The Collegeville Inn, a landmark in this Montgomery County town that is home to Ursinus College, is on track to become an assisted living facility. The property at 3974, 3976 and 4000 Ridge Pike received conditional use approval from Lower Providence officials that will pave the way for it to be developed by Providence Place Senior Living, a company that was formed in 1998 by former Pennsylvania Gov. George M. Leader. The new facility would involve preserving the existing building and constructing a new structure that could house up to 172 residents, according to the township. Providence Place operates five senior living communities in Pennsylvania and is based in Hummeltown, Dauphin County. The property consists of three parcels on roughly 20 acres at the crossroads of Ridge Pike, Main Street and Route 29 and is not far from Route 422. The inn totals 37,512 square feet on four acres has parking for 300 vehicles. As the population and one of its biggest cohorts, Baby Boomers, age, the need for senior housing continues to grow. It has also started to catch the eye from real estate investors because returns have been outpacing other property types, becoming an alternative investment as the multifamily sector begins to cool. It has logged 4.66 percent in returns. That is expected to grow over the next decade, according to research from the National Investment Center for the Seniors Housing and Care Industry. Other data points to the strength of this property type. Occupancy for seniors housing has fared well, standing at its highest since 2007. Seniors housing has stood around 90 percent, independent living averaged 91.4 percent and assisted living properties at 88.4 percent, according to NIC. In addition, rents have gone up by 2.5 percent. Allen Distribution, a privately-owned and operated logistics company, will remain in its 321,333-square-foot industrial space at 100 Capital Ln. in Middletown, PA. Occupying the entire building, the firm's triple-net lease was renewed for one year. Based in Carlisle, PA, Allen Distribution opened in 1988 and now operates more than 6 million square feet in multiple warehouse locations including Stockton, CA and Ontario, Canada, offering supply chain management, freight consolidation and temperature-controlled warehousing and transportation. Co-working, maker and creative spaces are changing Philadelphia’s neighborhoods, bringing new firms to the City and creating opportunities for technologies to be developed and companies to grow, according to a panel of market participants convened by the Urban Land Institute’s Philadelphia District. Panelists focused on recent redevelopments and repurposing of several properties in the Philadelphia market, including the Edward W. Bok Technical High School, now known as BOK, a former vocational-technical training school in South Philadelphia that has been repurposed with retail, maker, and community spaces; the uCity Square area that includes the Science Center and Pennovation Works, a University of Pennsylvania incubator space. Attracting entrepreneurs to office space requires building a “magnet for innovation,” he says. The University of Pennsylvania had several centers of innovation clustered in specific life science disciplines, but they found it difficult to collaborate with outside partners, so they reorganized into a “hub and spoke” structure. Penn is working to make space available in the complex for entrepreneurs on more flexible, shorter lease terms. Many startup companies don’t have the capital resources to commit to longer leases, and being flexible will help keep promising students from the region’s universities in the region, contributing to the economy after they graduate, Papageorge says. The redevelopment of the Edward W. Bok Technical High School facility at 1901 S. 9th Street preserved an enormous Depression-era vocational school whose declining enrollment led the Philadelphia School District to close the facility. Scout acquired the property in a competitive bidding process, says Lindsey Scannapieco, managing partner. The transformation of the asset into a combination of maker space, retail space, and community activities is about 20 percent complete, she says. The 340,000 square-foot property is located about two miles from key development nexuses in the Philadelphia Navy Yard, University City, and the central business district, but the working class neighborhood doesn’t need additional housing stock, she says. In redeveloping the space, Scout took advantage of existing infrastructure in the building such as gas lines, extra heavy floor plates, and utilities serving former vocational and technical classrooms. There are about 70 tenants in the building, including a hat maker, glass blower, custom woodworking shops, a photography collective, printers, and even a tattoo parlor, Scannapieco says. The Science Center, part of the newly reconfigured uCity Square in University City, is reintroducing “an activated streetscape,” with green space, and “convening space” on the 14-acre parcel that once housed the University City High School, says Joe Reagan, senior vice president for development, Wexford Science + Technology.